I wonder if some of the 'key' sacrificial parts - such as the shear-pins - should've been upgraded to handle the extra forces that the 2015 A.I. Are there any other potential points of failure that exist? Mike, I can almost guarantee that the shear pins are the same ones used on the Tandem Island, which has longer amas and wider akas. I wouldn't think so, The TI with much more weight capacity larger AMA's has the same sheer bolts and AKA's, and arms (just reversed). There are a lot of TI's out there and the boats have been proven to be quite durable and capable. The new AI looks like another remarkable craft from Hobie. It appears the vast majority of AI/TI users with stock boats and sailing at normal stock boat speeds have no issues with the sheer bolts. I'm sure Keiths accident was a fluke occurance related to his speed, rough conditions where he hit a wave wrong. When you are moving fast the force of the water on the AMA from a boat wake or rough seas is much greater. The problem comes up not from the sheer bolt breaking (it is doing what it's supposed to do as a sacrificial component). It's what happens immediately afterward that is the problem (possible capsize if the AMA folds in completely). There are several ways to mitigate the problem, tramps, HAKA's, and simple safety backup lines, all pretty well documented on this wonderful forum. The force of water on a moving object grows exponentially as your speed increases. Only if your boat is massively modified and goes very fast, is when all those little things like AKA sheer bolts become a big issue (totally speed related). My opinion is even on a stock adventue boat you can't predict when that huge boat wake or rogue wave is going to hit you and sheer the nylon bolt, why take the chance is my thought just add a simple safety line (I think it should be in Hobies accessory catalog personally (with a clip on each end so fishermen can unclip it to swing their AMA in), a really simple safety mod especially with the offshore crowd. Sorry to hear about losing valuable equipment. I replaced my rear screw-in cleats with screw-in pad eyes and attached carabiners for extra more secure tie down points. I use the factory bungee, add some bungees, tether some items also. I think in the future I'll use webbing straps through the biners and tether everything. I'm curious if your hakas presented any additional challenges in righting the boat. Did they stay attached and just move with the akas as they folded back? Was there any equipment strapped to them that posed a problem? I can wait for your full report. The hakas, being designed for an AI, were 3-4" too wide, i.e., the right angle aluminum stops that just bridge the akas, those stops were too wide. The heavy bungee cord, which attaches the hakas to the akas, was no match for the forces involved. It was almost as if the hakas were not there. The hakas did not come off. One had my fishing rods/reels/paddle bungeed on--that was the one which did not collapse, and it was up in the air. The haka on the akas that did collapse had a chair & beach umbrella bungeed on. None of those things were lost, only my cooler & dry bag from the stern. BTW, I also replaced the stern cleats with screw-in padeyes--those simply un-bungeed in the rough seas...twice. As I mentioned earlier, the up haka was the only comfortable place I could grab to roll the boat back up. The up haka was also the highest, most leveraged hand hold that I could grab. Again, it was almost as if the hakas were not there during the capsize. When I finally get around to writing a more personal account of the event, it will be mostly a summary of what has been said here about the capsize and how to prevent it, and, my personal thoughts and struggles to get up on the boat--remember, I was thrown into the water twice. I am an elder (not a WaterTribe "elder," a real elder) and that definitely made it a physical struggle for me. On the other hand, it was not only my age, but other contributing factors, that made it a struggle. I follow this thread with great interrest. Not (yet!) capsized, but aware of what can be the result of it. One of the first lessons learned for me was that when something goes wrong, you know afterwards what was packed water proof. And what was NOT. I have today totally changed my point of view regards what is proper water proof packed. Glad it all went well in the end. Sorry to hear that you lost some gear. Lesson learned that bungees is not THAT trustworthy gives another thought about the front hatch. Now I am sure that I will add some security to keep that big front hatch closed. When the dodo hits the fan and the complete vehicle turtles, maybe the gear packed inside will force the bungees over the front hatch to give away (maybe just a little) and then the hull will take in water. That will make bad situation worse. I am impressed that you managed to righten the AI. And yes, due to age, that will be a task more undoable as time goes by. I am 62 and not certain I can do this anymore though I will try. I have changed my plastic shearing bolts to stainless ones. Yes, I have heared that maybe this is not the brightest idea. Will think this over again. Thanks for your comments, Thomas. I'm very worried about changing your shear pins to SS. It seems to me that the boat may experience powerful stresses when the standard Hobie shear pin breaks. SS pins may result in something else breaking. I just got a new idea this evening. Frankly, I can't wait to test it out, but I must...at least until tomorrow. Regarding your age, you are just a couple years older than I was when I started doing most of these things. You have MANY years to go. So you've joined that most exclusive of clubs, Keith ...those who've managed to capsize their Island. There are not many members. I've never quite qualified. You probably remember me reporting how friends sailing with me have come close after breaking AI shear pins in collisions? Fortunately they have avoided going all the way over. Glad you were all right and it didn't ruin your trip. Re the handles ...I never considered 'righting the overturned hull' in my campaign for keeping the handles. I knew I'd miss them for getting back into the boat. We have anchored and jumped off to swim around a few times and they certainly made getting back in easier. Your post highlights the importance of having a back-up for shear pin failure. I've been relying on the tramps, but after reading of one of FE Bob's mishaps, where his tramp buckles snapped, I will have to rethink this. Bob's bracing lines are a good idea, as are your righting lines. Looking forward to seeing what you come up with and thanks for reporting this mishap. I'm sure it will help others avoid what you went through. This thread would be much more fun w pictures. Keith, were the longer Amas burying at all? I take it you did not turtle? This is all very interesting and useful information. I remember in the not too distant past a heated discussion about whether the removed handles were a safety item. If they help you right a capsized boat or even just hold on to it in rough conditions I would say yes. In the 2015 TI/AI the sst padeye that was a well placed attachment point for a security line has also been removed. but that seems like a poor substitute for a dedicated padeye. IMO, the handles, the ama padeyes and dedicated mirage drive padeyes are all basic things that should be on these boats. Not accessories we should have to add later. Membership in that club may grow if my first time camping trip with my AI 2 is any measure. It was only about the 4th time I had sailed the boat--seems like a high rate of capsize to me. I did sign your petition, Stringy, but it was still when I was in the "inconvenient not to have handles, but not that big a deal" mode. I'm extreme now, what a dumb move. Every time I rinse my boat in the driveway, I wish I had handles. I don't have any pictures of the capsized boat, but it was quite a scene initially--a yard sale, really, with a couple Gatorade bottles, my large brim hat, and 2 dough boards used to clean fish all floating way. Ultimately my large blue dry bag and white cooler joined the parade. I didn't notice the amas burying to any extent. "Reefed?" NOHUHU, could you explain that term please? Actually, I did have one full wrap on the furler. I have a few pictures and even a video which was taken a little before the capsize. I believe the tip of the mast bounced off the bottom on the initial capsize, but it was near low tide and not deep enough to turtle--about 6-7' in the area. Of course, afterwards, when sand emptied out of the sail/mast sleeve, I realized it had hit bottom, and I was happy it did not break. It does seem that there were 1-2 things that could have gone wrong, but did not. @ Tony--Tony, I don't like getting old (Nancy says I should use the term "older"). So, I can't bring myself to talk about it. For sure, it is not all it is cracked up to be. Last edited by Chekika on Mon Apr 20, 2015 2:57 am, edited 1 time in total. Chris, I think some of these small things, like padeyes for the MirageDrive and one to attach the mainsheet block, are simply forgotten in the rush to get these boats out the door. I've added a few padeyes using stainless steel screws, while being careful that the points were not near any rudder/steering lines. Since the AI 2, sailed solo, is a large boat and sits high in the water, it is not a simple thing to re-board if you end up in the water some how. Like all quality sea kayaks, Hobie should string grab lines along both sides of the hull from bow to stern--just a simple safety feature. At the beginning of this thread, I planned to post the whole capsize story on my "Expedition" thread. Now, because so much has been said here, that plan seems like it would break up a good and instructive thread. So, here is my story of the capsize and recovery. This Google Earth image gives an overview of our route from Chokoloskee to Pavilion Key and the unusual event on the first day of our camping trip. Royd & Alison Whedon in their tandem, Sharon Hutkowski in her AI, and Joshua Morgan in his Kruger with Balogh sail and outriggers had launched first. Tom & Debbie Turner in their Tandem and I in my new 2015 AI 2 left 20-30 min later. 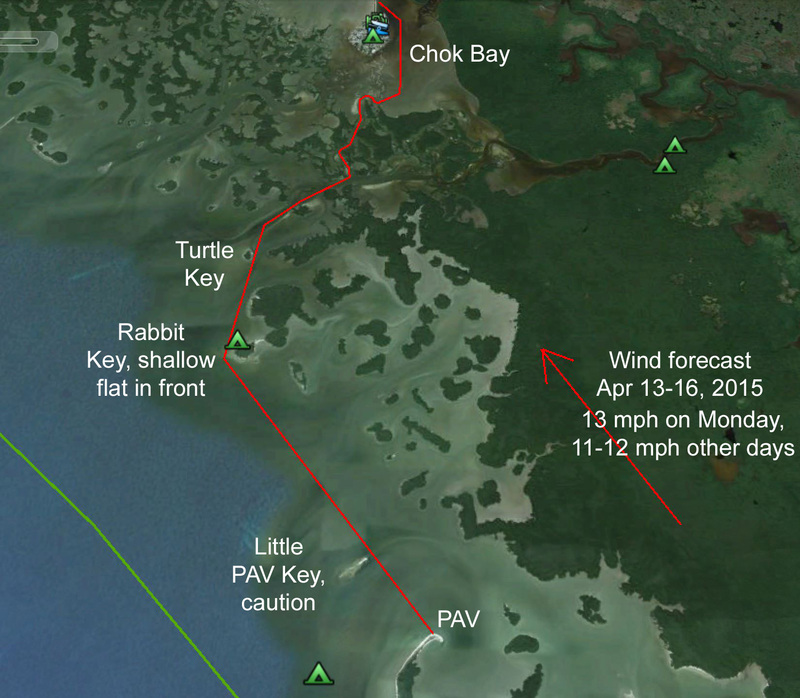 We had headwinds as we made our way down Chokoloskee Bay and through the passes. We tacked to the north of Turtle and then headed towards the outside tip of Rabbit. At one point, we both were on a tack towards the gravel bar connecting Rabbit and Lumber. I was surprised to see a Hobie Island beached there. It didn’t dawn on me until we were past Rabbit that it was Sharon. Tom & Debbie and I sailed south towards Pavilion. The winds were probably SSW at the time, so we were tacking. About a mile and one-half from Pavilion, I decided to make one more tack to the west. Tom radioed me that he thought my tack was unnecessary—he was right, but because of the winds, I did not hear the radio. On my port tack to the west, I took a few pictures and a video. The pictures & video show that I had a full wrap of the sail around the furler. The seas were rough, but nothing unusual in my mind. Winds were probably about 16 knots (18 mph). Near the end of the video, at about 40 sec in, you can see waves washing over the bow of my AI 2. The picture and the video are a bit deceptive—there were whitecaps everywhere. Both on the picture and the video, my camera had a drop of water on the lens. Turn up your volume to get a feeling for the sound of the wind. One moment I was on that port tack, a split second later, I was in the water wondering what had happened. My first thought was that it was a strong gust of wind, but within a minute, I realized it had to be a shear pin that had broken. 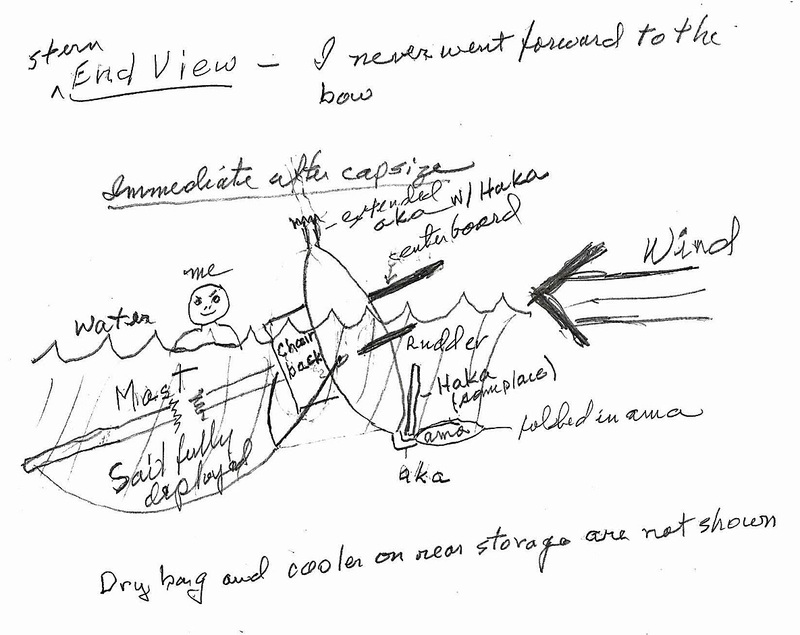 When first capsized, I could easily see Tom & Debbie about ¾ mi to the East. I suspect they did not see me because they were looking for a sail and not some capsized boat floating around in the whitecaps. Here is my very rough drawing of my situation at that point. Note: Within minutes the boat would rotate around 180 deg, so that the mast/sail were trailing and pointed into the wind. I stayed in touch with the boat (PFD on but too loose.) Within a couple minutes the boat rotated around so that the mast was on the windward side—I did not realize that had happened, since I was simply floating next to the boat and assessing the situation. Within a couple minutes, my new, blue 65L dry bag and cooler came un-bungeed from the rear storage area. I was next to them, so I re-bungeed them much stronger, and forgot about them. I moved around to the bottom of the boat (leeward side now) and gave some thought to righting it. This is where grab lines from bow to stern on both sides of the hull would help—moving around the boat when you are in the water. I realized that I had to release the sail first, so I returned to the topside of the boat (the windward side) and tried to detach the block from the sail clew. No luck. The main line was still cleated at the xbar and there was enough water pressure on the sail due to the movement of the boat from the strong winds that I could not get it detached from the clew. Moving forward to the xbar, I released the cleated main sheet. Even then, there was still sufficient pressure on the sail that it took considerable force to detach the main block from the clew, but it was done, and now the sail was free…it would hold no water as I pulled the boat back upright. I now moved around to the bottom of the boat. I don’t remember just what the situation was, but I somehow climbed up on the collapsed ama and centerboard. During this process, I realized I had a serious problem with the gear I was wearing. (1) I had heavy-soled neoprene boots on. (2) In addition, I was wearing my favorite dry pants with socks—they were full of water—that is, my dry pants w/ socks were acting like a bag full of water. I was standing on the collapsed ama with the haka at about knee height, but upside down. I had to remove my boots which I bungeed onto the bottom of the haka. I now looked over the boat and noticed my cooler and blue dry bag on the windward side were loose and floating off. I truly thought I was going to get the boat upright quickly and be able to round up this gear. Thinking that was a very expensive mistake. Also, I did not remember all the costly things that were in that bag. Had I been thinking properly, I could have radioed my friends on Pavilion. They would have been out in 15-20 min and picked up my gear. It was a major mistake! I did get the boat up, but there would be much, much more to do before I could try to get that gear. Next, I had to remove my dry pants—as mentioned, they were full of water. I bungeed them onto the haka. I had fabric socks on and felt they were too slippery on the ama, so I removed them. I’m now barefoot and in cargo shorts, but in a much better position to get the work done—righting the boat. Without mid-ship handles, there was only one place to grab to try and right the boat: the haka on the vertical aka/ama which had not collapsed. Frankly, it worked perfectly. I stood on the extended centerboard, grabbed the haka, and leaned back as far as possible. It was slow. At first it seemed nothing was happening. I expected that, and simply hung on leaning back as far as possible. It was exciting to see the mast begin to come up out of the water, and within a few seconds I was thrown back into the water, but the boat was upright. It looked beautiful! Now the situation was that I’m simply in the water between the ama and haka. The sail is flapping wildly, but I paid no attention to that. I needed to get back in the boat. Once the boat was upright, it seemed the extended aka/ama/haka stayed on the downwind (leeward) side—perhaps, the flapping sail was keeping it that way. I never felt in danger of flipping again. My problem now was to get back in the boat. I think with a sea kayak or even my 2011 AI, I could have climbed up on the stern and worked my way forward to the cockpit. I looked at the stern of my AI 2, and that option seemed impossible. It simply sat too high in the water and there was nothing to grab onto. The next option I considered was simply getting on the ama first. After a struggle, I was on the ama, sitting upright. It seemed to support my weight (190#) fine. Next, I had to leverage myself up onto the haka. I don’t know how I did that, but, shortly, I was sitting on the haka. It was pretty easy to slide over onto the seat. The Vantage seat was at an awful angle. I didn’t understand that, but I had more important things to worry about. 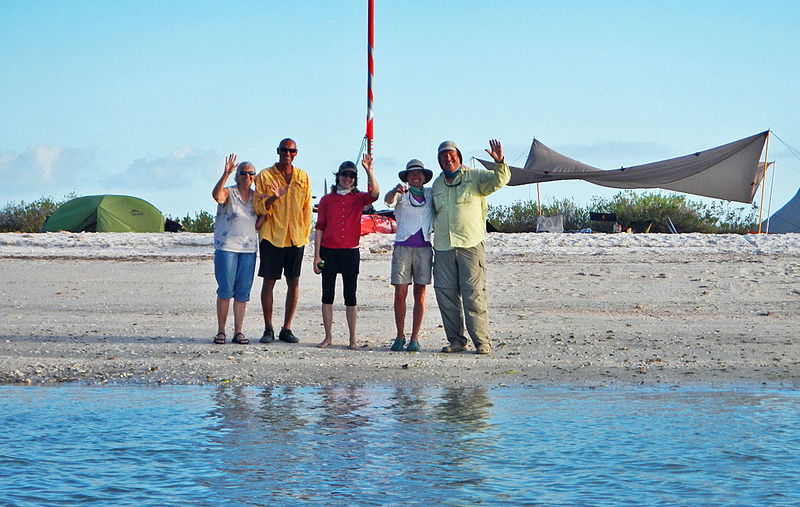 Of course, my gear bag and cooler were floating further away, and we were all floating in slightly different directions: the bag was headed northwest to northern Mexico/south Texas, and my cooler was floating north towards Rabbit Key, 2 miles away. The boat was apparently floating/sailing to the northeast—again, check the GE image above. The shear pin was, to be sure, broken. I took the spare, which had a split ring in the bottom, and replaced the broken pin. I had my Leatherman to help, but it all took time. The cooler and bag were, of course, continuing on their own trips. You can probably imagine my shock, when I went to attach the aka brace to the ball-knob next to my seat, only to see that it was gone! OMG! 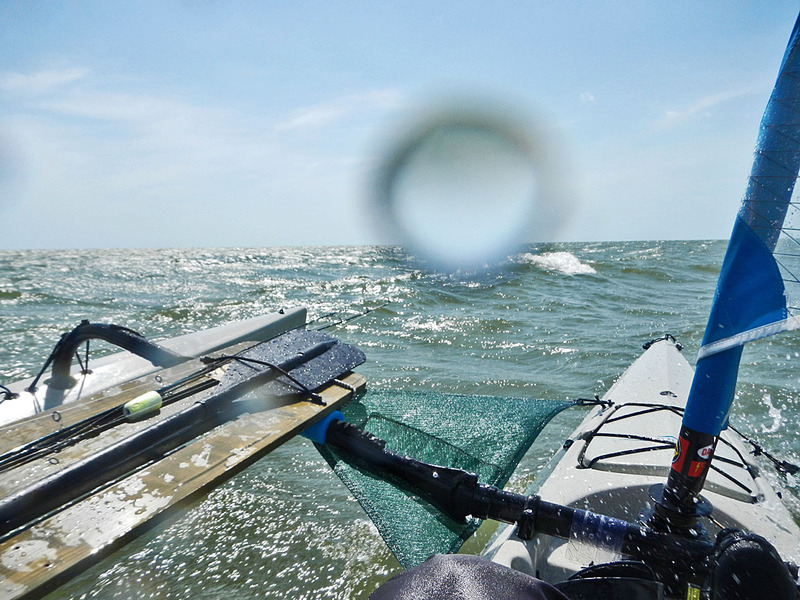 Apparently, after capsizing, the aka brace was still attached to the ball…and, working as a wrench in the rough waters. It simply unscrewed the ball, and it fell out. After getting my boat upright I sailed to Nancy’s Beach (our name)—it had been about a mile away when I first capsized, but I must have drifted towards it (see the GE image above), because it seemed the closest when I looked for a place to take shelter and get my boat in order. Nancy’s Beach is a nice little beach on the back side of a very small island. Nancy and I had stopped there many times when we kayaked the area years before. I put out a little bit of the sail and headed to the beach. I didn’t stop at the beach because that was still getting too much wind. I moved around a little further, but not before getting blown out away from the island, so that I had to pedal back. More wasted time. I opened my middle hatch to get my tool/parts dry bag—it had a little part which fit the threaded ball-knob thread, and I was back in business with the brace and collapsed ama, but there was another problem. I discovered that the boat was 1/3 full of water. It had laid on its side for over an hour, undoubtedly taking on the water through the front hatch. I found my hand pump was the cause of the seat being at an awkward angle—it had gotten jammed up under the seat. Now the seat was back to normal, and I pumped out the boat. But, it all took time, much too much time. The cooler and bag have now been floating away for at least 1½ to 2 hours. You know how it is, when things go wrong, it is usually not just one thing. In order to have any chance of finding my cooler and dry bag, I needed to get back to the vicinity of the accident. Unfortunately, my GPS was not working. It has been flaky for the past few weeks. I’ve since concluded it has a very delicate bad connection, which the slightest bump disconnects, and it shuts off. It has always restarted, but not this time (of course, it did start and work the next day, but not now when I desperately needed it.) I could only guess at where my accident happened. It would have been beyond sheer luck to have gotten anywhere close to the location of the accident…in addition, the gear has been floating away for 2 hrs now. Still, I went out there. I even furled my sail, stood up, and looked. All I saw was a sea full of whitecaps. There was no chance to see my white cooler, let alone a blue dry bag. The whole thing took way, way too much time. I literally still almost come to tears when I think of losing the dry bag—so much valuable stuff. I went on to Pavilion Key where my friends had set up camp. It was 6 hrs after we had launched and 30 minutes to sunset. They came down as I landed and asked where I had been. When I capsized, Tom and Debbie Turner were clearly visible about ¾ mile away as they tacked to the SE. I expected to see them turn and come to my aid. When they did not, I looked south to the Pavilion beach, again, expecting to see people gathering because “Keith has capsized.” Nothing. No one saw me go over. Once I was in camp, only slightly relaxed, I looked out to where I had capsized. It was obvious that no one could have seen my AI 2 lying on its side. The seas were too rough. My wonderful friends set up my tent for me and gave me food and water. You have to love them. Here they are, Alison & Royd Whedon, Rebeca Sensor, Debbie & Tom Turner. Not shown are Josh Morgan & Sharon Hutkowski. I could have used my VHF at any time to call people out to help. I simply thought, “I’ll do it myself.” Unfortunately, I did not realize that I would never get back to my dry bag, my cooler, and food. There were many lessons to be learned from this accident. Last edited by Chekika on Tue Mar 20, 2018 5:23 am, edited 2 times in total.